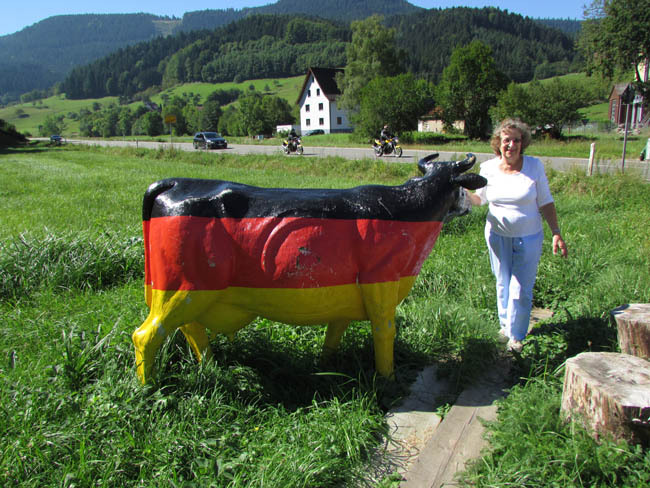 Gloria Temple with a German dairy cow during her ancestral trip along with her husband Ken, September, 2013 in the Black Forest of Germany. 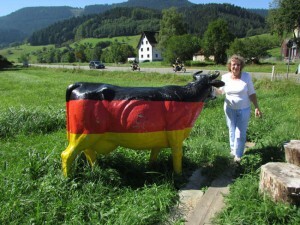 It’s time to break out the bratwurst as the United States celebrates German-American Day on Oct. 6. Commemorating the founding of Germantown, Pa. in 1683, the holiday celebrates America’s largest ancestry group, with 49 million people claiming part or full German heritage. Sisters Christina and Jennifer from Calgary enjoyed their tour in Germany in July, 2013. The two have German ancestry. So why are there so many German-Americans in the United States anyway? For some history, we turn to an English translation of “The German-Americans: An Ethnic Experience” by Willi Paul Adams from the Max Kade German Center. On October 6, 1683, thirteen Quaker families from Krefeld arrived in Philadelphia. From the outset, their settlement on the northern outskirts of Philadelphia was called Germantown. From then on, the tolerant Quaker colony of Pennsylvania served as a beachhead for the immigration of pietistic and other Protestant minorities, notably dissidents of the Reformed and Lutheran persuasion. When the first American census was taken in 1790, Pennsylvania’s German population was put at 225,000 which amounts to a third of the state’s entire population. If we further count those Germans who in the course of the 18th century settled in the English colonies of New York, New Jersey, Maryland, Virginia and South Carolina, especially those from the Palatinate, Baden and Wurttemberg, and include their children, then Americans of German origin were about 9% of the total population of the youthful United States around the close of the 18th century. 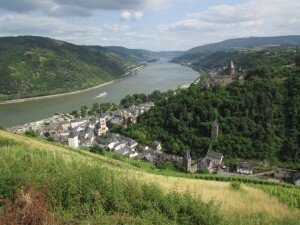 Bacharach on the Rhein River in Germany. Many emigrants used the Rhein as a waterway to leave their homes in Germany behind. European mass immigration to the United States began in earnest only after the end of the Napoleonic wars in 1815, at a time when unimpeded transatlantic commercial shipping resumed. Soon a first major wave of 20,000 emigrants from southwestern Germany took place, occasioned by major crop failures in the years 1816-17. The figures fell during the 1820s, but increased significantly in the 1830s. Since 1832, the areas of German emigrant origin shifted gradually to the West, later to the Northwest, and in the latter third of the century to the Northeast. Small farmers from the Southwest were followed by craftsmen and those engaged in the cottage industries, by day laborers and eventually by farm hands from Germany’s Northeast. As time went by, immigrants from all regions of the German Empire arrived in the United States where, allegedly, German dialect barriers between Bavarians and East Prussians were occasionally overcome with the help of English. The first peak of German immigration to North America came in the year 1854, when more than 220,000 arriving Germans were registered in American ports. After World War I, the age of unlimited European immigration to the United States came to an end. Newly-enacted immigration quota laws for the years 1924 and 1929 limited immigrants from the “Weimar Republic” to only 25,957 per year. Because of the world-wide economic crisis of the 1930s, this quota was never lifted, not even to rescue Jewish refugees from Nazi terror. For the entire decade of the 1930s, therefore, the statistics show only 119,107 legal immigrants from the German Reich — among them thousands of intellectuals, writers, artists, actors and musicians, making this a real “brain drain” for Germany. After World War II, generous exceptions were made for “Displaced Persons,” German war brides and others who could no longer envision a future in Europe. This amounted to a considerable number of postwar emigrants and brought about another “brain drain” of highly qualified persons during the 1950s and 60s. 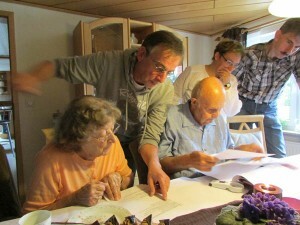 During these two decades, 786,000 Germans crossed the Atlantic to find a better standard of living and to experience the professional advancement they could not achieve in the hidebound structure of West German science and industry, prior to the sweeping cultural liberalization of the late 1960s. And that’s where all of the Germans come from (read more from this book at the Max Kade German Center). Why are there more Germans than Irish (numbering at 36 million)? For one thing, Germany is a vastly more populous country. For another, early German immigrants typically had more money and were able to move out to the less-crowded Midwest where they could thrive, according to the Independence Hall Association of Pennsylvania. A majority of counties in Pennsylvania, Michigan, Illinois, Missouri, Iowa, Wisconsin, Minnesota, Kansas, Nebraska, Wyoming, Montana and the Dakotas are predominantly German, and they make up a plurality of Ohio and Indiana counties. Census figures show German-Americans are slightly older and better-educated than the general population, with one-third having a bachelor’s degree or higher. More than 85 percent live in the same place as they did in 2009, and 40 percent are employed in management, business, science or the arts. 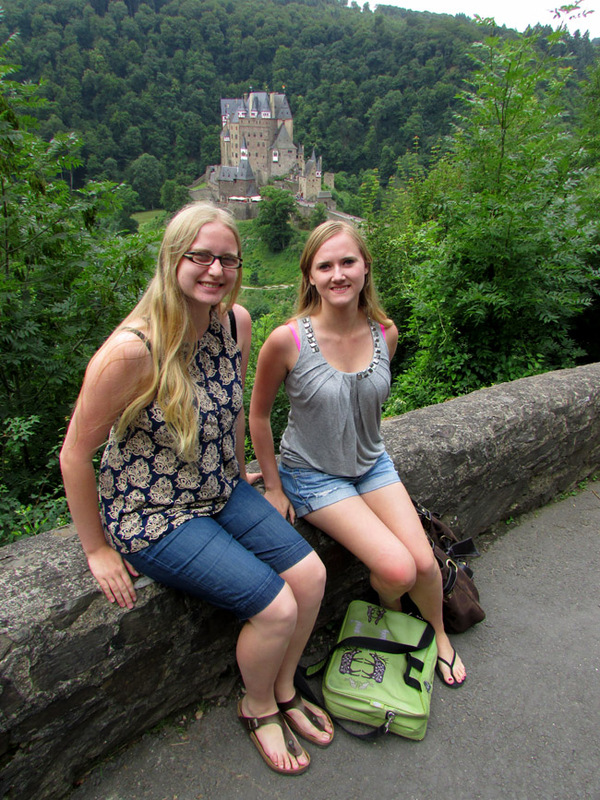 Posted in Family History Tours, Germany Tours and tagged ancestry, genealogy, german, germany, guide, guided, in, private, tours.